OneraSystems has the latest innovative solar solution for Billboards, SolBoard™. It opens new horizons for the use of Solar Energy in Billboards providing a unique turnkey system to meet all your lighting needs. SolBoard™ eliminates the need for diesel power and is the right step that paves the way for a revolution in the world of Solar Energy applications. SolBoard™ is a model that provides a source of reserve electric power. The system ensures that you can lit your Billboard, away from the Grid, and eliminate the use of diesel generator. The system works by generating electricity during day time, store the generated energy into storage batteries, and use the stored energy during night time to operate high efficient Flood LED lighting fixtures automatically after Sun Set. 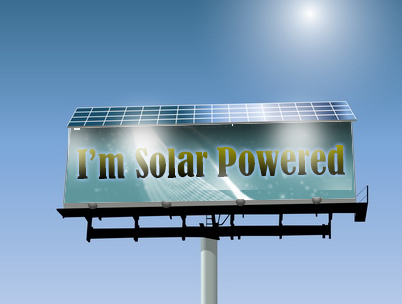 SolBoard™ PV Solar System has been designed to provide seamless power supply to Billboards at Zero Operation Cost. It consists of World-class quality PV solar modules which generate electricity, batteries to store energy, Solar Controller to regulate voltage and protect batteries while charging and discharging and Flood LED Lighting Fixtures. SolBoard™ operates in a smart exquisite manner. During daytime, PV solar modules transfer sunlight into electricity which goes directly to batteries for recharging. During nighttime, Solar Controller allows batteries to provide LED Fixtures with necessary power for the required operating time. At Day Time, Solar Modules will recharge batteries to be ready for night use. SolBoard™ is a “Fix-n-Forget” system that is virtually free of maintenance charges and onerous refueling hassle required for fossil fuel generators.